Fast office furniture were very efficient from start to finish, there was a good stream of communication and delivery was fast. They assembled and arranged the furniture so it was ready to go, we will definitely use them again in the future and highly recommend them to others. Excellent service. Rang to confirm arrival half an hour before delivery, assembled the desk and return, took away the packaging and even vacuumed the floor. Completely happy with my new office furniture and would highly recommend Fast Office Furniture to anyone looking for excellent service. Georgia was amazing and so helpful. I live in Perth and the delivery was quicker, easier and cheaper than anyone I found here. We placed a large order to set up our new office space and I am pleased to say that the experience was very easy. From order to installation I have had no issues and the office looks great. Big thanks to Denise who was very helpful throughout the whole process. Our office is really looking great with the new set up! Must also note that the prices are very good, I went to a few places around melbourne before I made the choice. Happy customer. Very responsive, very helpful, goods collected by courier with no issues at all and arrived in pristine condition. Fantastic quality products and amazing after sales service. Thoroughly recommend this company and amazing people that work there. Will definitely use Fast Office Furniture again. Good communication with sales staff and the assembly team were amazing; polite, fast, and even cleaned up afterwards! We have used Fast Office Furniture for a while now, and it is always a pleasure doing business with them. Fast, efficient and always reliable. This the the 2nd purchase from Fast Office Furniture and everything went very smoothly. Would definitely purchase from them again. My new office furniture is just what I wanted, the customer service is great and the delivery is very fast! Excellent website. Great communication after I placed the order. Delivery drivers called before delivery and installation was excellent. Would certainly recommend. Quality service from order to delivery. All communication was excellent making the process fast and efficient. Thank you. I purchased a corner desk from Fast Office Furniture in December 2018. They had the best price and charged a reasonable amount for delivery unlike some other places. Great service from the beginning all the way through to delivery and very happy with the desk. Great service and great product! Was installed quickly on-site with minimal disruption. I placed my order in on a Monday and I had it delivered to me by the Wednesday. I was phoned 30 minutes prior to delivery to make sure I was home. All too easy and very happy with our new product. Great customer experience from the first call to delivery of your item. 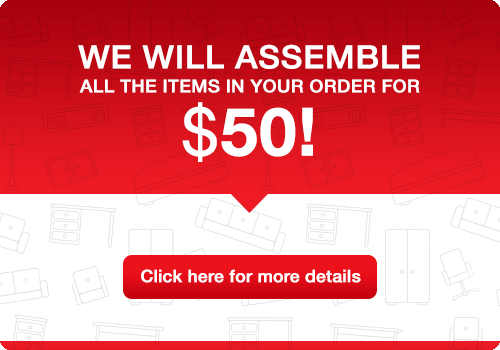 We have purchased several items from your company with delivery & assembly, with service being impeccable. Thank You! Excellent service. Prompt delivery and installation. Never any issues when dealing with Fast Office Furniture. Highly recommend. We have used Fast Office Furniture a few times now, they are excellent to deal with and extremely helpful and easy. We also really appreciate the email updates on delivery eta's, these are very helpful. Payment is also very easy - over the phone. Highly recommend. Fast Office furniture kept me informed every step of the way regards the status of my order. A wonderful change as I am so used to having to chase after status reports on the majority of products I order for our business. They delivered as promised and assembled the table with no interruption to our business whatsoever .They even took away the empty boxes. Happy to highly recommend them to anyone requiring their services! Zip Money – Buy Now. Pay Later. Copyright © Fast Office Furniture Pty Ltd. All rights reserved.